Here are some other tutotials that may be helpful while completing this project. With this set up, you can try to catch Santa coming down the chimney, but even if he's clever enough to get past motion sensor without being detected, you can catch him when he goes to drink the milk left out for him. The LED is connected from ground to 5V through a resistor so it will be lit when there is power. This functions as an “ON” indicator, should the circuitry be far away from the RedBoard. The motion sensor has an alarm pin that goes LOW when it detects motion, so we can check that by hooking it up to the RedBoard and using a resistor to pull it to HIGH (or 5V) when it isn’t detecting motion. The tilt sensor acts like a closed circuit when it is upright. However, it acts like an open circuit if it is tilted past 15 degrees. 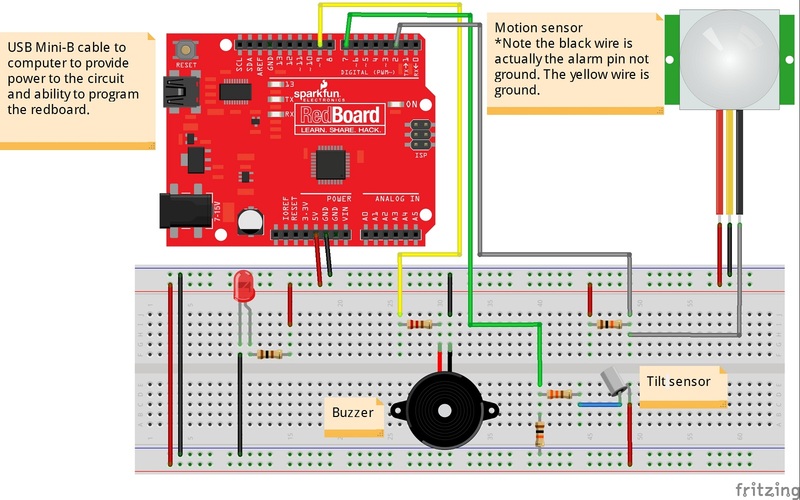 This means that we can set up a circuit with two resistors and hook it up to the RedBoard so that when the tilt sensor is upright, the RedBoard pin will read HIGH (or 5V), and, when it is tilted, the RedBoard pin will read LOW (0V or Ground). All that is left is to hook up the buzzer, which just needs to go from ground to an output pin from the RedBoard, where the RedBoard can give it power. In this fritzing diagram, it’s set up with a resistor, but that isn’t needed unless you want the buzzer to be quieter. The bigger the resister you put in series with the buzzer, the less noise the buzzer will make. 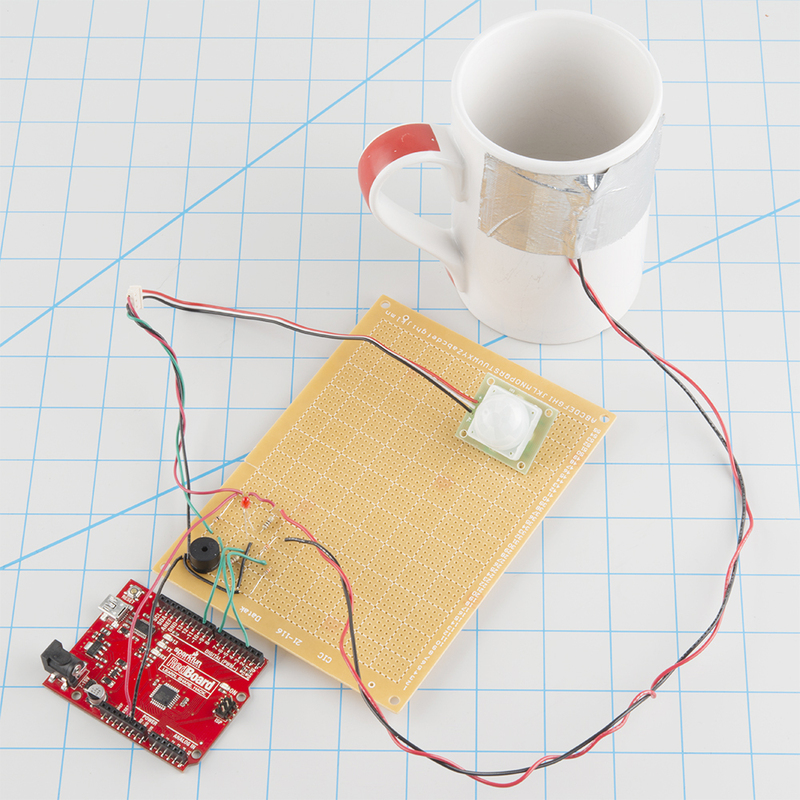 With some programing to the RedBoard, which can be programmed with Arduino IDE, we can program the buzzer to play a song when motion or the cup tilting is detected. Upload the following code to your RedBoard. // actaully deteced or if it was a false read. // checking that the last 6 tests came back sensing motion or tilt. if (notes[i] == ' ') // is this a rest? // corresponding frequency in Hz for the tone() function. // add more notes, you'll need to use unique characters. // we find it, we'll return the frequency for that note. if (names[i] == note)         // Is this the one? // but we still need to return a value, so return 0. With this you should have everything you need to put it all together. Once you have everything hooked up and you upload the included code you should be ready for Santa! For more Christmas electronics fun, check out these other SparkFun projects.